Tammy Kirks opened Red Bee Designs in the spring of 2000 offering handcrafted beaded jewelry. In 2002, she began silversmithing and expanded the line to include pieces fabricated from both sterling and fine silver. The beaded designs were eventually discontinued, allowing her to concentrate fully on honing her metalwork skills. In the spring of 2004, enamels and granulation were added after Tammy began working with nationally known enamel artist Sarah Perkins. 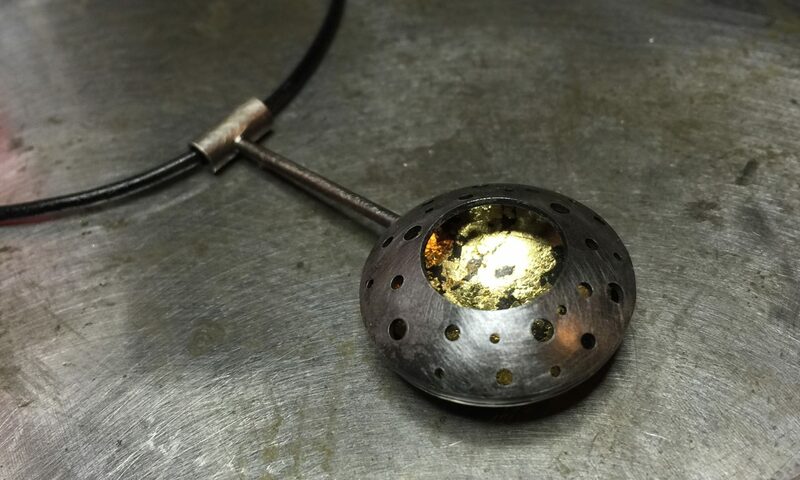 In the fall of 2012, Tammy began working with carbon steel, using it to create a whole new line of contemporary clean jewelry. Current work includes sterling silver, carbon (mild) steel, and touches of gold leaf. Tammy is a graduate of Drury University with a Bachelor of Science in Communication and has 20 years of graphic design experience. Red Bee Designs metalwork can be purchased at shops and gift stores across the Midwest. Retailers interested in purchasing a design series like those seen in the photo gallery can contact Tammy by email or call at (417) 894-4400.